Click here to read the homily delivered by Very Rev. Patrick Woods, C.Ss.R., during the funeral Mass at the St. John Neumann Residence at Stella Maris. 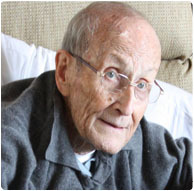 Redemptorist Brother Gilbert Mary Hunter, who could find a cheerful word for anyone he encountered, died Saturday, March 13, at St. John Neumann Residence, Stella Maris, in Timonium, MD. He was 89 years old. Born in Boston on Aug. 10, 1920, Brother Gilbert was the son of Michael and Margaret Clifford Hunter. He was given the baptismal name of John Lawrence and grew up in St. Thomas Aquinas Parish. He was drawn to the life of a Redemptorist Brother and made his first profession of vows in 1940 and his final profession in 1945. Brother Gilbert served variously as an office worker, sacristan and maintenance worker. His first assignment was to Buffalo, NY, and his second was to St. Cecilia Church in East Harlem, NY. Father John Gauci, who grew up in that parish, recalled that “Brother Gilbert raised us all.” The young Brother trained the parish boys as altar servers, organized them into a church cleaning crew, and encouraged them in their ball games, Father Gauci said. Further assignments were to Redemptorist communities in Pittsburgh, PA; Ilchester, MD; Esopus, NY; Washington, DC; and Boston. Citing personal reasons, Brother Gilbert applied for a dispensation from his vows, which was granted in 1956. He became a chiropractor and was licensed in the State of New York. Living simply, giving financial help to his family, and becoming active in parish life, Brother Gilbert still maintained his ties of friendship with a number of Redemptorists. It was in 1996, after he retired professionally and after he had cared for his mother in her last illness, that he began to listen to his former confreres who told him, “Gil, you never really left us.” With the encouragement of many Redemptorists, especially the late Father Edward Tardiff, Mr. Hunter applied to be accepted back into the Redemptorists. As it happened, the Provincial Superior then was the late Father George Keaveney, who remembered Brother Gilbert from Boston as being one of the people who inspired his own vocation to the Redemptorists. With permission from the General Government in Rome for a shortened novitiate, Father Keaveney warmly received Brother Gilbert’s vows on Oct. 16, 1997, at St. John Neumann Residence, then in Saratoga Springs, NY. Brother Gilbert’s devotion to Mary was of long-standing, but when he received permission to go to Medjugorje, his love for her became even deeper and more tender and he spoke of her frequently to anyone open to hearing him. When the Redemptorists closed their nursing home in Saratoga Springs, the community there was dispersed according to their health care needs. Brother Gilbert, along with confreres in need of full-time nursing care, was moved to the Redemptorist wing of Stella Maris, a facility owned by the Sisters of Mercy in Timonium, MD. Brother Gilbert is survived by two nephews, Donald Holmes of California and Paul Durgin of Massachusetts. There also are cousins and lifelong friends. Brother Gilbert Mary Hunter, C.Ss.R.